Located on the tip of Baja California, Cabo San Lucas is known for its warm waters, the beauty of its beaches, and the sports fishing. Acapulco offers travelers to Mexico's southern Pacific Coast a wide variety of choices, from beautiful private villas to a variety of hotel and resort accommodations. Located less than twelve miles off the Yucatan Peninsula, Cozumel is renown as a cruise ship port of call and as a legendary destination for Scuba Diving and snorkeling. Puerto Vallarta is located on Banderas Bay and is known for the rock formations that emerge from the bay's crystal waters. It is also a port of call for cruise ships, the U.S. Navy and the Mexican Navy maintains a base here. 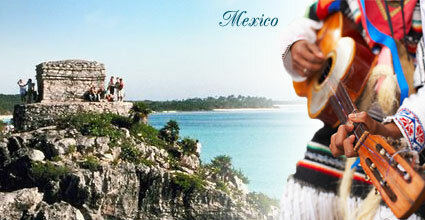 Playa Del Carmen and the Mayan Riviera region of the Yucatan Peninsula are very popular vacation destinations. Places to stay in Mexico, choose from Vacation Homes, Beach Resorts, Beachfront Villas or Condos for Rent. Contact Real Estate and Rental Property Management Companies, Private Home Owners, or Rental Managers for short term, seasonal house rentals, availability, summer rental rates or vacation rentals information. For more places to stay and vacation homes near Mexico, you may want to check out Belize or Costa Rica in Central America. Or, take a look at other Caribbean vacation holiday travel destinations.